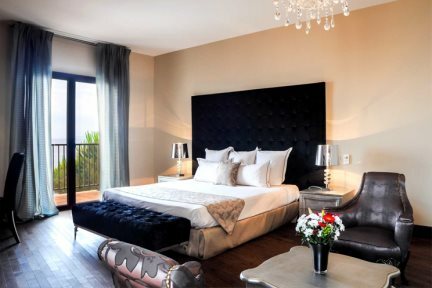 Hôtel Demeure Loredana is a stylish interior design hotel just a short walk into St Florent. Looking for a boutique hotel with a view? Hôtel Demeure Loredana will not disappoint... Situated just outside St Florent above the road leading to Patrimonio, this stylish 5-star hotel boasts stunning views over the bay to Cap Corse and the Désert des Agriates. 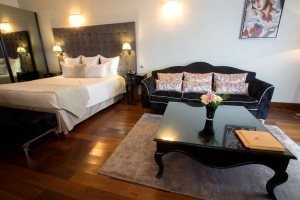 This, coupled with its luxurious feel and excellent service, makes it one of the most popular hotels in the area. 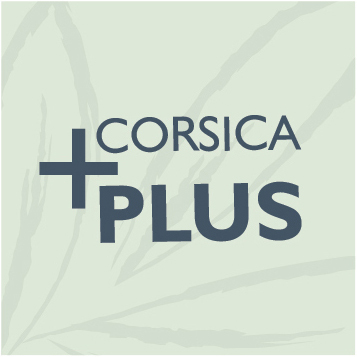 A stone’s throw from St Florent’s harbourside bars and restaurants, and a short drive from the magnificent and rugged Cap Corse mountains, discover Corsica at its best whilst enjoying a superb level of comfort and service at Demeure Loredana. Facilities include a large infinity pool surrounded by relaxing sunloungers, along with a second indoor heated pool and a Hammam. All rooms have been meticulously designed to create an understated glamour and an elegant finish. Start the day by taking breakfast, one of the best offered by any hotel on the island, on your own private balcony or terrace while enjoying the spectacular sea views. 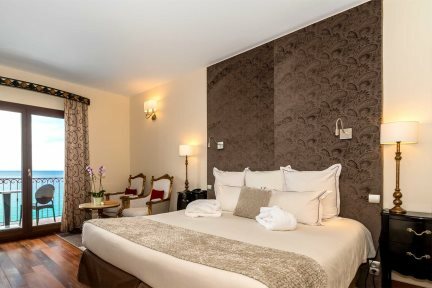 Hôtel Demeure Loredana is the perfect option for a romantic escape. "What we particularly enjoyed was to be able to have breakfast on our balcony each morning, with the wonderful view of the bay and the mountains." Outdoor infinity pool, (13m x 10m, max depth 2m), heated indoor swimming pool, Hammam, massage room (payable locally), Lounge/bar with panoramic views, snack service of local produce available in room or under the gazebo from 7.30am to 9pm. En-suite bathroom features bathtub, separate shower, hairdryer and separate wc. Seating area, television, telephone, mini-fridge, safe, air-conditioning, Wi-Fi. A 33m2 Double room with sitting area and bathtub, separate shower and separate wc. Balcony with sea view. 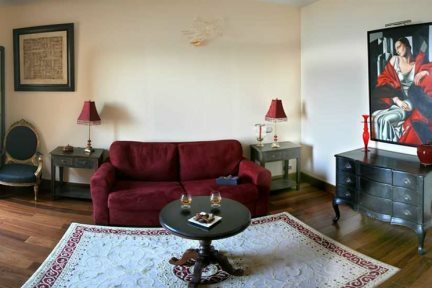 A 38m2 room with living room area and bathtub, separate shower. Balcony with sea view. A 45m2 room with living room area and bathtub, separate shower and separate wc. Balcony with sea view. A 54m2 room with separate living room area and bathtub, separate shower and separate wc. Balcony with sea view. 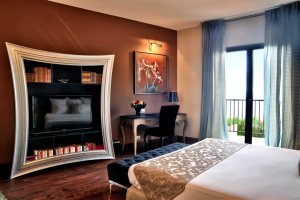 A larger 55m2 suite with double bed, living room area and bathtub. Balcony with sea view.